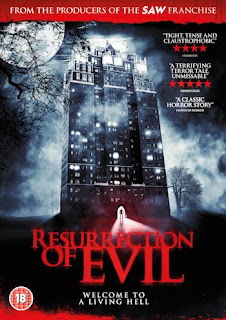 Buffy the Vampire slayer’s Julie Benz is a new tenant in an old apartment complex who discovers that something evil dwells within the walls in “Ressurection of Evil”, which has just been released to UK DVD from Thunderbird releasing. Set in New York, Benz plays Jackie Sullivan, a former alcoholic who’s just gotten out of rehab. In need of a place to live, she goes to look up her friend Danielle, who was staying at the Havenhurst apartment complex, which is an old gothic tower block. However, she arrives to find that Danielle and her boyfriend were evicted for bad behaviour the week previous. But the creepy old landlady (Fionnula Flanagan – The Others) says that she can take over her apartment, the only condition being that she adheres to the building’s one and only rule that tenants live “a good and decent life”. But Jackie begins to suspect that Danielle and her boyfriend weren’t just evicted, as they have seemingly disappeared. To make matters worse, it seems they are not the only tenants to have disappeared without trace from that complex. Looking into the buildings history, seems this is no ordinary apartment complex and a terrible secret lurks within the apartments walls. Sort of reminiscent of “People Under the Stairs” and the 2004 version of “Toolbox Murders”, for the most part “Resurrection of Evil” (also known as “Havenhurst” to give it it’s US title) is quite an effective horror/mystery thriller. But I felt I was let down by the ending, which I won’t spoil for you, but I felt was something of an anti-climax. Extras on the disc are limited to a trailer. "Ressurection of Evil" is out now on UK DVD from Thunderbird releasing.